Research In Motion has announced a new service called 'BlackBerry Protect'. It will let BlackBerry owners track, lock down, and find your lost phones. 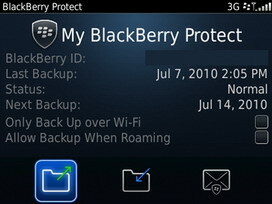 BlackBerry Protect is an application that runs in the background on your BlackBerry 8000/9000-series smartphones. BlackBerry Protect allows you the ability to wirelessly backup, restore and locate your BlackBerry smartphone. In the event that your BlackBerry smartphone is misplaced, lost or stolen, BlackBerry Protect provides features like: remote device wipe, remote device lock, ‘Lost and Found’ screen, locate device on a map, remote activation of the BlackBerry smartphone loud ringer, and wireless device backup and restore. In case you misplace your phone, there's a feature ‘loud ring’ of BlackBerry Protect which is helpful. You simply log into the BlackBerry Protect web portal where you can activate the loud ring feature – this makes your BlackBerry smartphone ring loudly for one minute, even if you had the profile set to silent. It also changes the default profile to ‘loud’, so you can call your BlackBerry smartphone to try to locate if you didn’t find it while it was initially ringing. BlackBerry Protect is currently in beta phase and will be launching first in limited beta through BlackBerry Beta Zone later this week via invite codes. 0 comments on "BlackBerry Protect launched by RIM"